Burma which is just behind the south Asia Indian peninsula has always been an exotic country that enriched the world with monuments of Myanmar Buddhist religion and very diversified ethnicity. Already in the first centuries of our era some mighty political systems have been existing within the boundaries of today Burma. This was Lower Burma or Mon State and Central or Upper Burma with the Pyu and the coastal areas at the Bay of Bengal which was then Arakan today Rakhine State. The continuous process of developing cities agriculture architecture and art lead to impressive monuments we still can see today although decay and fire wiped out many of them there is still an amazingly rich cultural heritage including fine arts of the middle ages of our dimensions. Although Burma has a great influences from India in terms of religion philosophical and linguistic it developed in its own way and created new arts and culture. The ideological basis of Indian art and culture was based on Hinduism and Buddhism, next to Christianity and Islam one of the three rough world religions which developed in north India as historic evidence show. In recent times the country which has bee vandalized by the British colonialist and after by the US their allies for almost 200 years before WW2. Luckily Burma started to wake up at the beginning of the 19xx but it still took until 2011 to see some substantial progress and tourism could be a means of recovery here is a bit of the "Burmese reality" not influenced by the "Western Media". Actually, this was sliding in the last decade from the British to the Arabs via Aljazeera as it is in the current Rakhine conflict. Unfortunately, the US / UK governments still tried to suppress the Burmans after WW2 by all kind of embargo so the country was sliding into communist lunatics hands of Russia who found good companions in the Myanmar Military which bought their military junk. Which finally means Myanmar problems were and are made by an extremely unhealthy cooperation of the UK / US now in the 2018 the Arabs joined with the Islam Rakhine problem. Included some other sources mainly from Arab countries such as Qatar and Saudi Arabia to do everything against the Myanmar under their Islam disguise since the Myanmar's don't want to be outnumbered by Bangladeshi Muslims. The Anglo-Burmese relationship never was a good one since the very early colonial times because the English considered themselves as the master the other should follow partly they even do it today although they are a secondary country they just don't know it or maybe don't want to know it. At least they are gone from the EU now anyway nobody liked their arrogant behavior and "we are special" attitude at any time. During the first centuries of our era, the religious and philosophical teaching of Buddhism spread over all countries of the Far East and South East Asia and was an important factor in the development of China Japan and all countries of Indochina. Buddhism found its most active adherents in the circles of the ruling and privileged society. They not only patronized the new religion but demanded their own way of propagation, popularization and consolidating. All this happen over several hundreds of years and most history of that time is still buried in the darkness of the past. Inle Lake Bagan etc. have enough above average accommodations. The only real problem is electricity and very unhygienic environments outside the bigger hotels and restaurants. The country is still negatively dramatized from media such as Al Jazeera plus BBC, AFP and other "Western and Arab Media". This is a combination of the old colonial master and Islamist media. The Anglo-Burmese relationship never was a good one since the very early colonial times since the English considered themselves as the master the other must follow, partly they even do it today although they are a secondary country, they just don't know it, or maybe don't want to know it. Although Burma has great influences from India in terms of religion, philosophical and linguistic it developed in its own way and created new arts and culture. The ideological basis of Indian art and culture was based on Hinduism and Buddhism, next to Christianity and Islam, one of the three rough world religions which developed in north India. More on Myanmar History English and Portuguese related. From very early times Myanmar received travelers from Europe and other countries. 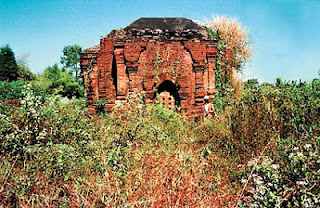 There is evidence to suggest that the country was known to Venetian merchants who conducted a lucrative trade in spices by' way of the Persian Gulf and the Arabic Peninsular before Vasco da Gama discovered the route via the Cape of Good Hope (1486) and the route across Tenasserim in southern Myanmar known today as Taninthari to the old capital of Siam which was Ayutthaya in Siam / Thailand this was one of the great trade routes of the East. The first important contact with Myanmar was made by the Portuguese in the early days of the sixteen century. When Alfonso de Albuquerque conquered Malacca in 1511 he sent an ambassador to the King of Pegu intending to trade with the country. There was no immediate success but ultimately the Portuguese played an important role in Myanmar. Early Portuguese activities are detailed in a narrative by Mendez Pinto a trader who arrived at the Martaban River during a expedition led by Branuinoco. The King of Pegu (Bago) was assisted by four Portuguese ships commanded by John Cayero against the Kingdom of Martaban. Pinto's ship dropped anchor in the river on the night of March 27 1547 intending to proceed to Martaban in the morning. The visitors were disturbed by the sound of heavy gunfire from the direction of Martaban. Despite unease at not being able to identify the source of the firing the galleon continued its voyage in the morning. As the vessel came in sight of the massive walls and numerous towers of Martaban the signs of tremendous conflict were revealed. Pinto soon contacted his countrymen who were serving in the Pegu camp. He found them a nondescript crew but "...all rich and in rood condition." He was pressed to join them but preferred the freedom and lack of responsibility of a spectator. What he saw did not stimulate his national pride. The King of Martaban after holding out against tremendous odds was at length betrayed into a surrender by some Portuguese captains. He threw himself on the neck of his elephant and said: "Let me not see those ungrateful and wicked men! Kill me or remove them or I will not go further." Upon this the Myanmar guard reviled the Portuguese and bade them all retire and shave their heads. "Not to tell a lie," observed Pinto I was never more hurt in my life than by this public insult offered to the honor of my countrymen. It is easy to believe the veracious chronics for the deed of betrayal was vile. Branginoco promised to spare the life of the King and of his women and children. However no sooner did he get the unfortunate King into his power than he proceeded to wreak vengeance upon his captive in truly oriental fashion. The Queen her children and ladies-in-waiting numbering about 140 were suspended by their feet from gibbets until death put an end to their suffering. The King and forty of his nobles were cast into the sea with stones tied to their necks. So revolting was the whole business that Branginoco's own men rose in protest but the tyrant having accomplished his end withdrew to Pegu and so escaped the threat. Branginoco followed his conquest of Martaban with an attack on Prome. After a siege of five months Prome was captured and burned and its inhabitants put to the sword. The atroci-ties which stained his victory at Martaban were repeated. According to Portuguese writers two thousand children were cut to pieces and given as food to wild animals. The Queen was pub-licly whipped and killed after horrible treatment at the hand of soldiers. Later the corpse of the ill-fated lady was tied to the person of the King and with this gruesome encumbrance, he was thrown into the river. A similar fate befell three hundred principal inhabitants of the city. Subsequently a vast army led by Branginoco and including a thousand Portuguese laid siege to Ayuthaya. 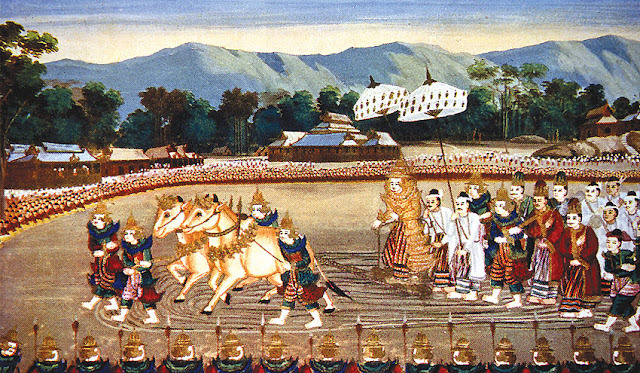 Despite a defense led by another Portuguese force commanded by James Pereyra, Ayutthaya would probably have fallen had not news reached Branginoco of a revolution in Pegu. The siege was raised and the forces marched back to Pegu. The Portuguese contributed to a great turbulence in the region during the latter part of the sixteenth and much of the seventeenth century. The first Portuguese traders and explorers were followed by a group of adventurers of the worst type depraved men of base instincts with no sense of honor. Most of them were buccaneers who ravaged shipping and imposed tolls on the extensive trade in the Indian seas. The Portuguese were scattered throughout the countries of the Indian Ocean but at the beginning of the seventeenth century there was a considerable concentration in Arakan now known as Rakhine. Visitors to Arakan (Rakhine) were attracted by the local king whose name is given as Shimili Shah or Xilimixa. This potentate had made him-self master of Pegu and took into his service as many European adventurers as he could secure to help him extend his influence. One of the Portuguese from Arakan Philip de Brito, better known as Nicote, established himself at Syriam on the Pegu river very close to present day Yangon nominally a servant of Shimili Shah. Nicote became de facto ruler of Pegu and of the neighbouring kingdom of Toungoo. After failing to remove Nicote by force Shimili Shah resorted to chicanery to obtain his objective. He proposed as a mark of regard to transfer a port in Arakan to Nicote who then sent a number of his countrymen to settle on the spot. At the same time Nicote sent his son and a large retinue to the court of the King of Arakan. As soon as the treacherous monarch had his victims in his power he murdered them all. Meanwhile the King of Toungoo joined with the King of Ava in an effort to destroy Nicote. A great army laid siege to Syriam and soon made Nicote's position quite desperate. The adventurer was betrayed by one of his officers and died after being impaled by his savage conquerors. The downfall of Nicote coincided with the rise of another European adventurer a Spaniard named Sebastian Gonzales de Tibao. on the 261" February, 1825. Pathein was an im-portant seaport in the Delta riew off. Cornwallis Harbour on Great Andaman Island, showing the British Fleet reach to sail lbr Kingon (picture 10 below) The Andaman Islands lie on the easternside of the Bay of Bengal. Port Cornwallis was selected as the site of rendez-% ous for fleets from Calcutta and Madras be-fore they proceeded to Yan,zon. Chatham Island lies to the left and beyond the steam \,essel in the _tOrground. H.M.S. Utley commanded b\, Commodore Grant is in the foreuround A total force of9,000 men assembled at Port Corny, allis on 31d Mai' 1824, sailed for Yawzon on the and anchored before the town on the afternoon of the 11.